Move over Millennial Pink, there is a new shade in town! Meet Dusty Rose and all of the new home decor products in this lovely shade of pink. 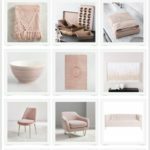 Shades of blush pink have been hot for a few years now. Colors like Millennial Pink, Soft Rose, and Rose Quartz have been adopted all throughout home decor. You see it in paints, fabrics, and lots of accessories. As we head closer to St. Valentine’s Day, I have rosy visions and am seemingly attracted to pink everything! It’s no secret that I love incorporating pink into my own home decor. 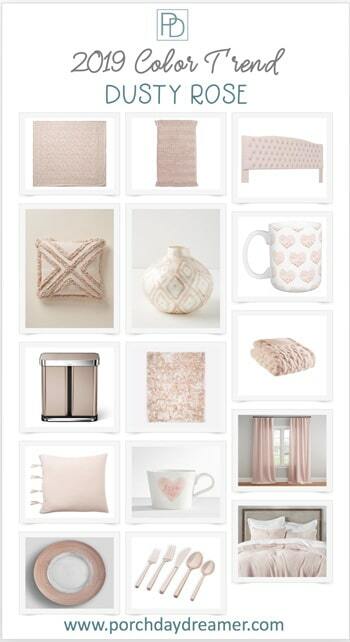 Soft shades of pink have become a new home decor neutral. Well the old pink is shifting to what I am calling Dusty Rose and I’ve got lots of products you can incorporate into your home this year! 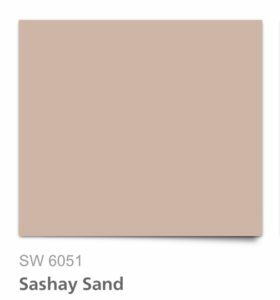 Sherwin William’s color of the year last year “Sashay Sand” led the pack shifting pinks away from cool blue undertones. The new pinks are sliding toward peach and much warmer, which makes me think 80’s pinks! 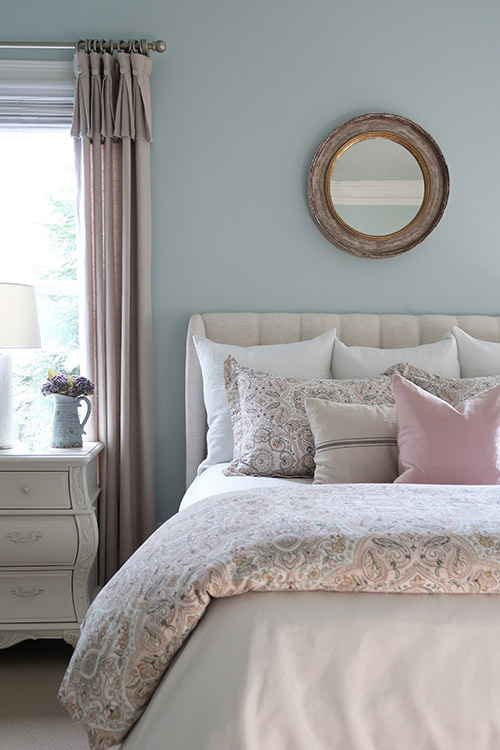 Recently, I wrote all about the 2019 Paint Color Trends and called out one of Valspar’s colors of the year “Blushing Bride”. Most of the major paint manufacturers have a new shade of pink paint in their mix this year. 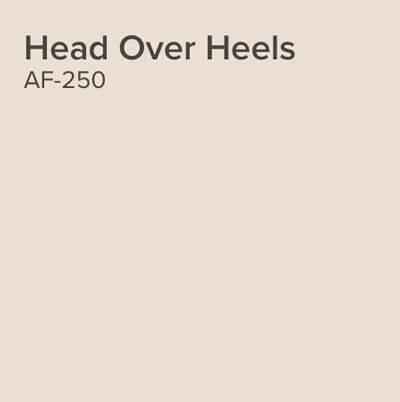 Benjamin Moore selected Head Over Heels as one of their pinks in their 2019 Colors of Year. 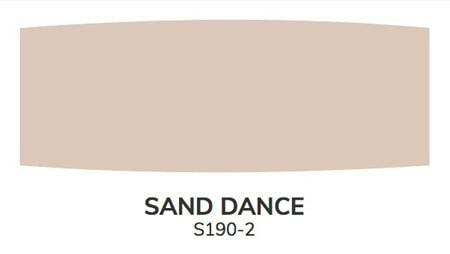 Behr selected Sand Dance to coordinate with their color of the year Blueprint. 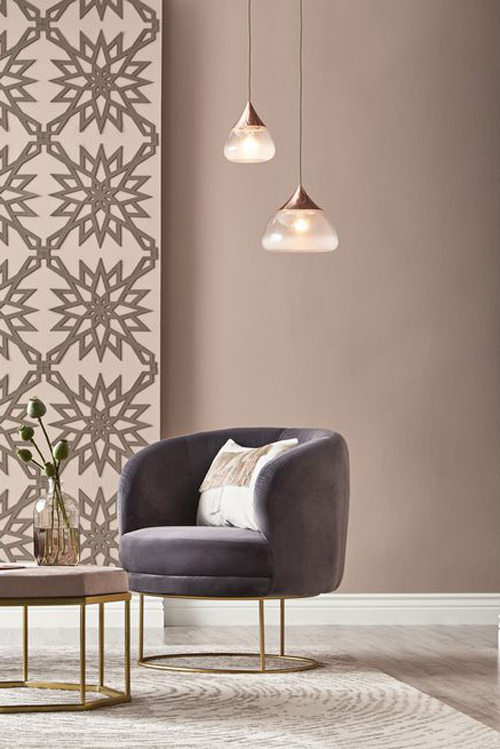 I recently used Blueprint in my Power Room makeover and it’s amazing that it looks beautiful paired with Sand Dance too! I must tell you I am SO happy to see pink still in the mix, so I don’t have to redecorate anytime soon. Here’s my bedroom’s current palette after I redecorated this past fall. Do you see how the new pinks are different from what I used? My accent pillow has a more blue and cool undertone. The duvet and shams are right on trend, so with some inexpensive accent pillows I can shift the pinks in this room. Watch this spring as new apparel and home decor is debuted. You will start to see a new crop of warmer pinks appear with a peachier feel and a little dustier too (grayed). Since I had Valentine’s Day on the mind, I threw in a few gift ideas in heart motifs! There are so many easy and inexpensive ways to add this new pink to your home. What REALLY surprised me was that I found Simple Human trash cans in this new color-way and even a juicer. Please consider signing up for my weekly newsletter, so you never miss a post, tip or trick!